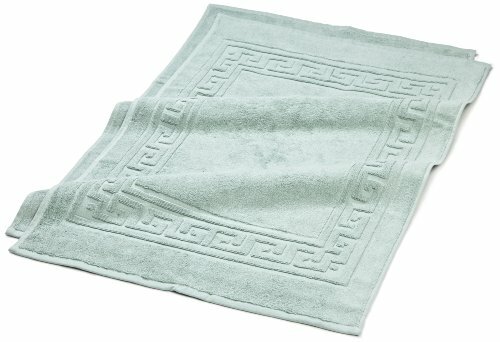 Our luxurious bath mats provide a quick and beautiful update to any bathroom or spa décor. Made of 100% Premium Cotton that is combed to remove all imperfections, these classic geometric bath mats are made to last and are able to go through the washing machine without any wear and tear or fade of color. Each set comes with two bath mats: perfect for shared bathrooms, or for homes with multiple bathrooms. The pure cotton construction means that these bathroom floor mats are more absorbent than microfiber bath rugs, and dry faster than memory foam bath mats. Available in 15 gorgeous colors, these bathroom towel mat sets will look beautiful in your master bathroom or guest bathroom. Coordinating luxurious hotel & spa quality 3 Piece Sets, 6 Piece Sets, Face Towels, Hand Towels, Bath Towels, and Bath Sheets are available separately. We have been manufacturing fine linens for over 40 years. We make everything from towels and bath robes, to comforters and mattress toppers, sheets, duvets, pillowcases, and bedskirts, and even area rugs. Our wide range of colors, patterns, and price points ensures that every one of our customers will be able to find something they'll love. We are experts in manufacturing high quality textiles and pride ourselves on only producing the finest products. "This is a very well made bath mat, thick and absorbent"
"Amazing product of very high quality. Lasts forever.. Beats anything else I've ever seen. Best of all does not slip in bathroom floor"
"Gorgeous, luxurious and PLUSH! The Greek key border is well done. If your bath decor is 5 star hotel, you MUST get these"
"I've had them for about two months now and I love them. These are very well made and launder great!" "Exceptional as usual. Great color. Thick, great size. I LOVE being able to toss them in the washer and keep our bathroom as clean as possible... I will be buying more"
"Wow!!! These are the best bath mats ever… Bought two and will purchase more"
And try them for yourself! If you have any questions about this product by Superior, contact us by completing and submitting the form below. If you are looking for a specif part number, please include it with your message.